It is now thirty years since the Falklands War took place. Many alive today will have only the vaguest idea about what it was all about. It came at a particularly sharp moment in the economic crisis in Britain and the CWO saw it as a key event at the time. Despite our size we gave out tens of thousands of leaflets calling on workers in both Argentina and Britain to strike against the war and refuse to support it. This brought us in hundreds of pounds in donations from workers who asked us to print even more. One of them is printed below. Five years ago we published the final article we wrote in Workers’ Voice after that conflict ended [see Revolutionary Perspectives 43, £3 from our address, or leftcom.org]. The leaflet reprinted below adds to that archival document. This is an act of reflection rather than commemoration. Neither the leaflet, nor the article, are the best we wrote, but they do summarise a lot of our thinking, both good and bad, at the time. Moreover looking back at this episode is no mere exercise in political archaeology as many of the issues it raised are still with us. By a curious irony the Falklands issue is once again topical. We don’t just mean the arrival of the Meryl Streep film about Thatcher, “The Iron Lady”, on the big screen. More significantly the anniversary has coincided with the latest bout of diplomatic fisticuffs in the South Atlantic. Much of the rhetoric is due to the fact that Christina Kirchner, the Argentine President faces re-election this year but there are also deeper issues at stake. The latest tiff between Britain and Argentina really comes over the issue of oil. The famous Argentine anglophile (and conservative) writer, Jorge Luis Borges likened the original conflict to one of “two bald men fighting over a comb”. A brilliant image but one which does not take into account the material factors behind imperialist wars, even little ones. Back in April 1982 when the British Government sent its fleet off to the South Atlantic, we said that Argentina’s military junta had invaded in “a gamble to gain the oil, fishing and mineral rights around the islands and its dependencies in the Antarctic in an attempt to ease the crisis” (Workers’ Voice 7 May 1982) but when we spoke of oil then we spoke only of a hypothesis. Since February 2010 the search for oil off the Falklands has become a serious project. So serious in fact that the Brown Government ordered a two day military exercise in December 2009 code-named “Cape Bayonet” which “simulated an enemy invasion....”. The exercise involving Typhoon multi-role fighters and warships “took place during a tour of the Falklands by British forces ahead of the start of drilling in the basin in February 2010” (both quotes from United Press International, 28 Dec 2009). Oil has been found (by the British company Rockhopper) but as yet the amount is not clear (the shares of the Falklands Oil and Gas company go up and down with every new announcement) but seismic tests by the British Geological Survey have suggested that it could be as large as 60 billion barrels. As we suggested in 1982 this is not just a fight over the Falklands but also over the wider issue of the mineral and food resources of Antarctica. Back in 2009 Britain submitted a claim to the United Nations Commission on the Limits of the Continental Shelf for one million square kilometres in the South Atlantic reaching into the Antarctic Ocean. This was two days before the deadline for such claims (15 May 2009) was due to expire. It is the biggest landgrab since the heyday of the British Empire. The Falklands Islands, the Sandwich Isles and South Georgia (also claimed by Argentina) are strategically important for the development of such a claim. It is therefore a piece of sheer cheek (or arrogance in his case) for Cameron to describe the Argentinians as behaving like old style “colonialists”. In fact the British had been prepared in 1980 to give Argentina the islands (the diplomatic signals from those talks gave the military in Argentina the green light to plan their invasion and this was why the Foreign Secretary Lord Carrington resigned as soon as the invasion took place). The British today talk of the “right of self-determination” of the islanders as their main argument for defending them tooth and nail. This was what they said in 1982 but it was an outright lie. The inhabitants of Diego Garcia (who were unceremoniously evicted to make way for a US air base in the Indian Ocean in the 1960s) can bear ample witness to the fact that the British government did not give a toss for the “rights of islanders” when it suited them. In fact Falkland Islanders were denied British citizenship and refused the right to come to Britain until after the 1982 conflict. It is only since then they have been granted British citizenship. On the Argentine side Galtieri inherited the invasion plan drawn up by his predecessors the year before. The brutality of the military regime (30,000 had “disappeared in the so-called “Dirty War” conducted by the Armed Forces) could not longer withstand the economic crisis (inflation was 150% a year and unemployment on a par with Britain) and social unrest in Argentina. It was no coincidence that a massive demonstration of half a million people in March 1982 in Buenos Aires took place only 5 days before the decision to invade. For the military it was the final throw of the dice to save their regime. As it was it brought their murderous rule to an end. There are in fact some striking parallels today with the situation in 1982. Global economic recession was hitting both Argentina and the UK. In the UK in January 1982 the unemployment level had doubled to 3 millions after two years of the Thatcher Government (which had largely won the election in June 1979 on the slogan “Labour Isn’t Working” as unemployment had reached one and half million for the first time since the Thirties under Callaghan). Inflation had reached over 22% and opinion polls showed that Thatcher was the most unpopular Prime Minister of all time (even beating Neville Chamberlain). And as the Tories intended to slash the state budget, the military and in particular the British Navy, was due for more severe cuts (the Secretary for the Navy Keith Speed resigned when he heard of them in 1981). Little wonder that the bosses of the Navy were absolutely the keenest to mount the expedition to the Falklands. It restored their position and many of the cuts were postponed (starting with the immediate reversal of a promise to sell an aircraft carrier to Australia). They are up to the same old tricks today as it is people like Admiral Sir Sandy Woodward (leader of the 100 ship Falklands Task Force in 1982) who are writing in the Telegraph claiming that invading the Falklands will be easy meat for Argentina if current government cuts go through. It is true that the Royal Navy has lost its aircraft carriers, its Harrier jump jets (which were obsolete anyway as they have a range of less than 200 miles) and seen its warship fleet cut in half over the last decade. What he forgets is that in 1982 the islands had no major operational military base of 1000 infantry at Mount Pleasant (35 miles from Stanley) backed up by 4 Typhoon fighters and a frigate which might have made the Argentine dictators think twice. That is the situation today and every civilian leader in Argentina since 1982 has excluded getting the Malvinas back through the use of force. The most striking parallel though is the fact that once again we have two regimes imposing austerity on their working class: Two regimes that don’t mind a little nationalist confrontation to distract our attention away from their economic failings. In fact the Falklands War saved Thatcher. The consequence was a wave of jingoism (summed up in the Sun’s adulation of every success in headlines like “Gotcha” (on the sinking of the Belgrano (which was away from the combat zone) with the loss of 364 lives) or “Rejoice” (quoting Thatcher at the end of the war)) not seen since the Second World War. Up to this point Thatcher was not only the most unpopular Prime Minister in history but her government had no clear policy other than to try to increase the cuts started by the previous Labour regime. Although the steel workers had been defeated (largely thanks to their union (the ISTC) headed by Bill Sirs, later renowned as a personal friend of Thatcher) wildcat strikes by miners (1981) had already forced the Government to retreat on pit closures. A year later the tide of jingoism and a split in the Labour Party (leading to the formation of the Social Democrats) led to a Conservative landslide. With this, plus the fact that unemployment was now at an all time high, the scene was set for the confrontation with the miners which was to be the defining struggle of the 1980s. As we wrote at the time “a defeat for the miners will be a defeat for the entire working class” and so it turned out to be. At the same time too the British ruling class stumbled on the realisation that mass unemployment was a great tool for disciplining the class struggle and used it to push through policies which the post-war settlement between capital and labour would previously have considered unthinkable. Deregulation and privatisation followed and the whole basis of the speculative economy which burst in 2007-8 was set up. Restructuring of British industry was made inevitable by the crisis but the Falklands War gave such a boost to the ruling class that it happened faster and in more confrontational way in the UK than anywhere else in Europe. The destruction of British manufacturing industry also tore the heart out of the great concentrations of the working class and destroyed whole communities. The British victory in the Falklands War though had other repercussions. In the first place it demonstrated that imperialist adventures could be undertaken without the rest of the population being involved. Wars fought a long way from home by professional soldiers and which don’t have too many casualties don’t have the impact of a world war where the entire resources of a state have to be mobilised. It is probably not an exaggeration to say that this was behind Blair’s commitment of the UK to supporting the US in Afghanistan and Iraq. After all he went to war despite the greatest demonstration ever seen in the UK against it (15 February 2003). 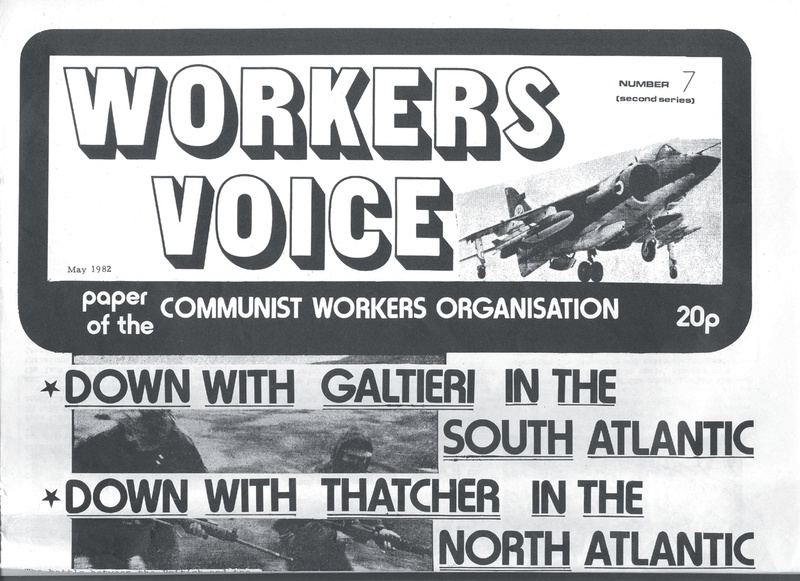 There is not even much scope for workers striking for their own interests despite the war (as Hawker-Siddeley and Portsmouth dockyard workers did in 1982) since so few workers are actually directly involved in these local wars. Instead it is a bit like the scenario in Orwell’s 1984 where distant wars are fought over issues which few understand and in which yesterday’s friend (e.g. Saddam Hussein)may become tomorrow’s enemy. The wars themselves are thus turned into nationalist propaganda opportunities (such as the Wootton Bassett salute to returning corpses “spontaneously” organised by the British Legion, or the “Help for Heroes” campaign). In such circumstances “revolutionary defeatism” had to have a slightly different meaning and in the Falklands War we tried to articulate it. We also tried to repeat it in the Iraq War by joining with others in the No War But Class War campaign in 2003. Revolutionary defeatism today means that we make no sacrifices of our living standards or existence for the “good of the country”. Rejection of austerity programmes is part of that. There was no shortage of empirical evidence at the time for the view that the build up towards World War Three was taking place. The arms race of the Cold War was just then reaching its height. Reagan’s announcement of the Star Wars programme, the placing of Pershing missiles in Western Europe and the adoption of Trident and Cruise missiles (to be housed at Greenham Common) at this time all gave the impression that war preparations were rapidly advancing. Only three months before the Falklands War, CND managed to achieve its greatest anti-nuclear demonstration ever (referred to in the article cited). What we did not know at the time was that the KBG was actually carrying out an exercise which concluded that nuclear war was not winnable by the USSR (and the assumption was that any conventional war would escalate into a nuclear one in an all-out contest between the USSR and the USA). The arms race was bankrupting the Soviet Union (it accounted for 25% of its GDP whilst the USA was spending 6% of its) just as US planners hoped it would. The KGB were now calling for an end to the arms race and more significantly reform of the declining USSR (Brezhnev’s reign was referred to as “the years of stagnation”). In this context the death of Brezhnev (also in 1982) provoked a split in the Politburo which the KBG candidate, Andropov won but he died 15 months later and was replaced by the Brezhnevite, Chernenko who halted any idea of reform. Only on his death in 1985 did the reformers win out with the appointment of Gorbachev. Gorbachev did not intend to destroy the USSR. On the contrary he intended to turn it round (his early speeches called for a return to Lenin’s Russia although it as not clear what he meant by that). Gorbachev’s glasnost and perestroika though did not make him popular with an apparatus which had long established itself as new ruling class whose privileges were now in danger and they sabotaged at every stage the intended reform until finally they attempted to overthrow Gorbachev. The attempted coup led to the first case in history of a major imperialist power collapsing without first provoking an imperialist war. By 1989 we were ready for this development but in 1982 we were not. Five years ago we added a footnote to our introduction (1) to explain our mistake but our error ran deeper that just being outdated by the facts. In 1982 we still held a mechanical view of the relationship of the crisis to the class struggle and imperialist war. Like many other new communist groups which appeared as a result of the capitalist crisis (which we date from the early 70s) we expected the material situation to be resolved into one of “war or revolution” relatively quickly. We very quickly recognised that the wave of militancy in the early 1970s (which had produced new groups like the CWO) was fairly limited and that a qualitative leap in class consciousness would be required in order for the subjective factor for revolution to be on the agenda. We expected it to be something like the previous crises before the First and Second World Wars which had ended up in imperialist war within a decade. What we failed to take into account was that in the epoch of state capitalism the mechanisms for sustaining the system are incredibly more sophisticated and able thus enable the crisis, and also its consequences, to be more drawn out. Indeed it was only in 1983 at our annual general meeting (with observers from the ICC, Battaglia Comunista and the SSUCM present) that we began to reflect on this and rejected the draft theses presented to the organisation which predicted that imperialist war was now imminent. More significantly comrades at that meeting began to question the methodology which had brought us to expect the imminence of either World War Three or a significant proletarian response. This began a process of change of perspectives which would be developed over the next few years. The perspectives we finally published in 1983 (in Revolutionary Perspectives 21 [Second Series]) were something of a compromise. “War or revolution” were still said to be the historical outcomes of the crisis but there was now a recognition that the crisis was unlikely to be resolved any time soon. Indeed this crisis of the end of the cycle of capital accumulation has now lasted so long that until 2007-8 some were beginning to ask whether it was a valid analysis at all. Now that the bursting of the speculative boom has taken place this is no longer the issue. As we discovered in 1982-3 there is no mechanical link between crisis and “war or revolution” and even now, at this stage of the crisis, we cannot say that proletarian revolution or generalised imperialist war are beckoning on the immediate horizon. Despite the depth of the crisis which has even had the Financial Times recognising that it took the Second World War to cure the last crisis of accumulation (see “Sovereign Debt and the Fight against the System” in Revolutionary Perspectives 58 p.4) neither proletarian revolution nor general imperialist war are likely in the short term. Despite the objective situation of an insoluble capitalist crisis, despite all the programmes of austerity which have shifted the burden onto the working class the world working class has yet to respond in a coherent and collective fashion. There are a multitude of reasons for this, which we have analysed in many articles over the last few years, but the basic class solidarity which existed 40 years ago no longer exists to the same extent. It may be in the process of being rebuilt and the inevitable struggles in the months ahead will answer this for us. On the imperialist war front the there is no shortage of conflict and rivalry from Chinese soft power stealthily establishing itself in the Indian Ocean and Africa to the cyber wars being played by various powers (including the US-Israeli axis against Iran). However there is no clear fracture line of two opposing camps which indicates what course all these rivalries will ultimately take. You can see this in the fact that various comrades who insist on the proximity of imperialist wars all point to different conflicts of interest. Some highlight US-China rivalry, others the West (NATO) versus the Shanghai Cooperation Council (Russia, China and Iran) and of course there are still those like Samuel P. Huntington who point to the “clash of civilisations” between the West and Islamic fundamentalism. But the lack of agreement suggest that the game of thrust and counter thrust, the “petty” rivalries for big stakes and the localised wars will go on for some time before anything more dramatic evolves to untie the Gordian knot of imperialist rivalry. For revolutionaries, for now, the main issue remains just how long the working class is prepared to tolerate a system which promises another decade of declining living standards for those who create its wealth. This is the challenge which throws enormous responsibility on to those who still think the proletariat is the only class capable of assuring we live in a future society without exploitation and oppression to constantly develop both theoretically and organisationally. (1) See leftcom.org or send for Revolutionary Perspectives 41 (£3 UK from group address). Jock's final paragraph in the article re 30 years after the Falklands war refers to 'the main issue' and 'responsibility'. Is it not likely that the working class will wait for as long as it takes for the most appropriate party to become apparent until a clear lead is provided on the means to end poverty and war ? Have comrades read statement 'What Is the International Communist Party' on the website internationalcommunistparty.org ? It is well-written. It printed out on 32 pages of A4. The article as of February 2012 (8 pages) 'Depth of the general crisis and historical delay in the proletarian revolution' ends with the following:- 'On the basis of this enthusiasm and this sentiment, on the basis of class solidarity, under the guidance of a party that has merited the name of class party, the conviction will become so strong that nothing will be able to stop us from wrenching the future of the human race from the criminal hands of the bourgeoisie.'. Iran is not a member of the Shanghai Cooperation Council, only an observer, just like Pakistan and India.